What do you think is the key metric that predicts the success of salesperson? Conversion rates? Sales cycle length? Average purchase value or profit margin? Nope. It’s none of these. The metric that predicts sales success is the amount of time that a salesperson spends in meaningful selling conversations with customers. Justin Roff-Marsh reports in his book, The Machine: A Radical Approach to the Design of the Sales Function, that a field salesperson should be able to hold four of these conversations a day, five days a week, leading to twenty meaningful conversations each week. An inside salesperson can conduct thirty conversations each day, which leads to 150 conversations each week. Unfortunately, most salespeople fall far short of this goal. The job requirements of most salespeople simply don’t allow them to spend much of their time in meaningful sales conversations. In fact, a study by Alexander Proudfoot revealed that they only spend about 10% of their time selling. Why is this? What stops sales professionals from working at their capacity? It’s simple. 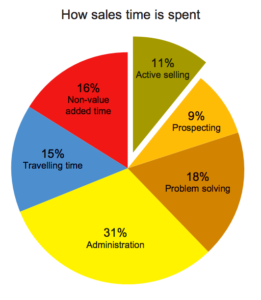 Salespeople have many responsibilities in addition to selling. They must prospect for customers, design solutions, complete administrative tasks, and solve problems for existing customers. They are so bogged down with these other tasks that they simply can’t schedule very many sales conversations each week. Time spent doing anything but talking to customers is the enemy of your salespeople. But wait? Haven’t sales people always been responsible for all sales-related activities in addition to selling—prospecting, customer service, administration and solution design? Yes, they have. Traditionally, salespeople have been autonomous agents for the company. They worked their territory and conducted all sales-related tasks. Roff-Marsh explains that those days are gone because of two fundamental shifts in how sales works. 1. Markets have become much more competitive. Selling is harder. It used to be that product development and production released a highly differentiated product at a good price and selling it was more straightforward. Manufacturing was the primary driver of success as companies invested in operations productivity improvement. As more and more companies have reached the limit of dramatic productivity improvement in product development and operations, they are shifting their attention and their capital to productivity improvement in sales. 2. Customers want custom solutions. Sales must work closely with engineering and production to design these solutions. In the past most companies produced a stockpile of inventory and salespeople sold from this stockpile. This allowed salespeople to work independently from the rest of the company. No longer. The value chain has shifted away from make-to-stock toward make-to-order environments or even make-to-engineer. Nothing is produced until an order is placed. Sales must work closely with production and engineering to customize solutions for customers. They can no longer work as independently as they did in the past. If markets are more competitive and customers demand custom solutions, how can salespeople respond and conduct the number of necessary sales conversations each week? To answer that question, lets look at manufacturing. This organization has seen dramatic increases in productivity over the last several decades. How did they do it? Manufacturing shifted away from the craft model of production. It adopted a division of labor model which led to dramatic increases in productivity. The corresponding solution for sales would be to shift from autonomous selling to team-based selling. This change will lead to massive performance improvements. Field people will spend 100% of their time in the field, conducting four business development meetings a day, five days a week. Skilled inside salespeople will produce high volumes of sales activity at very low cost. Companies can consistently meet customer commitments, complete administrative work on time, and receive sales more frequently and more predictably. Not only that, companies which have adopted this model have seen improvements in the relationships with other people in the organization. They’ve eliminated hand-off problems between sales and production. Marketing works closely with sales to supply them with a constant stream of sales opportunities. The way companies achieve these results is by shifting from autonomous salespeople to giving the responsibility of sales to a centrally coordinated team. What obstacles face a company that wants to achieve these performance improvements by dividing the labor of sales among the members of a centrally coordinated team? Complexity. Sales continues to increase in complexity. Multiple influencers and decision-makers. Conversations with multiple groups that occur over many months. Too many opportunities arise for a lost sale if you divide the labor of a professional salesperson among the members of a team. Is complexity a reason to avoid the division of labor? If it were, then we would expect that the most complex manufacturing environments would avoid the division of labor. In fact the opposite is true. The most complicated production processes—jet aircraft, automobiles, computer chips—all rely on the division of labor and tightly coordinated teams to do their work. Personal relationships. While many salespeople cultivate good relationships with their customers, Roff-Marsh cautions us to ask which came first, the initial sale or the relationship? In fact, in most cases the relationship came after the sale. It did not cause the sale. And even after the first sale, the relationship is not the reason that customers continue to buy. Companies retain their customers primarily because they meet their customers’ requirements for production performance. They deliver on time, a completed order, with high quality. Although sales complexity and the tradition of personal relationships shouldn’t stop you from moving forward, that doesn’t mean it’s easy to make the transition to the benefits of team-based selling. Fortunately we can follow the well-trodden path that has been taken by production to make this transition. If you follow these methods developed by Roff-Marsh, you’ll experience greater scalability and predictability in your business. Your selling costs will go down and your quality will go up. How Do We Know That Sales Process Engineering Works?